Quote: "In this complicated world of ours, it’s good to know that smart and passionate people like Robert Nix are diligently using music to understand this complex home planet of ours." This CD's title reminds us that it’s a complicated world after all, and its creator, Robert Nix, doesn’t try to convince us otherwise. Nix’s singing voice sometimes sounds eerily like Jim Morrison of The Doors, who was himself an especially complicated individual. The world may be a complicated place, but Nix applies basic, good musical values to his songs here. In addition to this CD’s title track, “A Black Spot On Humanity” also reveals how Nix consistently applies a big picture viewpoint to his lyrics. His songs alternate between being guitar-based and keyboard-based, with “A Black Spot On Humanity” exemplifying one of his keyboard-oriented songs. This latter track also utilizes orchestral string elements. In contrast to his mostly wide angle lens lyrics, “She Means A Lot To Her Friends And Family” is positively microscopic in comparison. Nix can become extremely passionate while he’s singing, which sets the contrastingly quiet “It’s The Day’s End” apart from the rest. In this complicated world of ours, it’s good to know that smart and passionate people like Robert Nix are diligently using music to understand this complex home planet of ours. Only listened to the 30secs available on Itunes without a download. The lyrics have got me very intreged. They are sung with such passion and sensitivity. Hard to comprehend a MAN can FEEL so much sensuality, love, admiration and awe about a WOMAN. 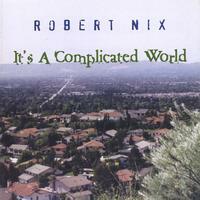 Robert Nix is not a simplistic songwriter. Each of his songs has a special message or meaning. the album holds your interest all the way through, because it is not predictable. There is cohesion - but not boredom. Robert's approach to each song is unique, because each story that he is telling is unique..... In my opinion, it is the individual stories that make this album so interesting and appealing. ....Another thing that I really appreciate is the production quality. Robert is a good songwriter, and with this collection of songs, he challenges us to think about things.